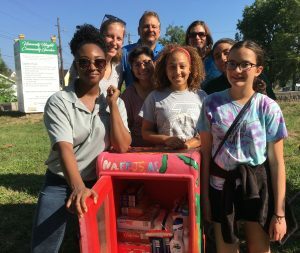 Volunteers installed two “Little Pantries” near the University of Indianapolis campus in July 2018. Project managers say while the pantries themselves may be small, they can make a big difference for families. According to 2015 data, nearly 32 percent of residents in the SoIndy geographic area are living in poverty. “This project is a perfect example of the community coming together with our assets and resources to address a local need,” said Michelle Strahl Salinas, South Indy Quality of Life Plan director. The SoIndy Little Pantries, located in University Heights and Bean Creek neighborhoods are the latest example of the ongoing partnership between the University of Indianapolis and Community Health Network to increase access to health- and wellness-related opportunities for Indianapolis Southside residents. Additional partners in the pantry project include the South Indy Quality of Life Plan’s Health & Wellness Action Team, Purdue Extension and the Garfield Park Art Center. The partnership brought volunteers together to create the UIndy and CHNw Community Garden (Serve 360°) at 4002 Otterbein Street (near the University Heights United Methodist Church) earlier this year, providing nutritious produce for residents in the University Heights and Carson Heights neighborhoods. The SoIndy Little Pantries offer free staples such as rice and pasta to supplement the fresh vegetables from the garden, which are also available to residents at no cost. Gurinder Hohl, who directs the partnership between the University of Indianapolis and Community Health Network, said the SoIndy Health & Wellness Action Team, which operates as part of the South Indy Quality of Life Plan, has played a significant role in developing and implementing solutions to address the various food insecurity-related issues identified in the needs assessment conducted from fall 2014 to spring 2016. Hohl, along with Amie Wojytna, assistant professor of kinesiology, and Rob Campbell, Director of Business Operations at Community Health Network, and Anye Carson, senior public health student at UIndy, secured in-kind support for projects such as the community garden. “The concept of the community garden, as well as the little pantry, is based on the principles of placemaking. By beautification and infrastructure bolstering, the community develops pride, and this results in future investments to enhance the quality of living,” Hohl explained. Salinas, who also manages the Garfield Park Farmers Market, said the combined garden and pantry projects are the next evolution of the South Indy Quality of Life Plan to address health and wellness – and residents are taking notice. “Neighbors are starting to ask questions about how the garden works, so there is some anticipation growing,” she said. The Community Garden provided the theme for the Center for Aging & Community’s Grand Camp in June, which brought grandparents and children together to learn about gardening and other activities. It will also be featured in the 2018 Harvest Ride on September 8, during which cyclists will stop at six gardens to learn about the impact of community gardens on surrounding communities. Volunteers, including University of Indianapolis students, will manage the SoIndy Little Pantries, which were designed and painted by summer art camp students at the Garfield Park Art Center.